Juan Mata says he’ll always remember a particular bit of advice given to him by Unai Emery. The Manchester United star was managed by the current Arsenal boss for two years at Valencia between 2009 and 2011, before he left to join Chelsea in the Premier League. Mata – who scored for United in their comeback victory over Juventus on Wednesday evening – features heavily in a new book about Emery, who has overseen a successful start to his career at the Gunners, who are currently on a 14-match unbeaten run in all competitions. 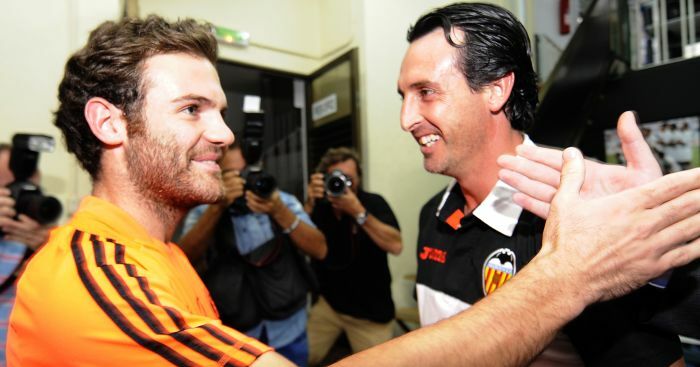 Having already revealed what makes Emery “special” in one extract from the book, Mata also speaks about how the 47-year-old would shield the Valencia players from negative comments in the press. “One particular memory stands out for me,” he said. “He was talking about the criticism we’d received after we’d lost a match. “This was pretty harsh, and so he talked about our relationship with the press and how we should react to the criticisms: ‘I don’t read what they write about us when things are going badly. I don’t let myself be influenced by what they might say, and only read the press when things are going well’. “He liked positive thinking and the fact that it gives you more energy. “He was also the first manager who talked to us about the incredibly complicated relationship there can be with criticism: the pressure, the repercussions and how to manage them. “If you’re a professional footballer, you’re open to negative comments with every game, but he showed us that we were above all that, that the journalists could say what they liked, we had to concentrate on our job, which was to make progress. Quick sale! Kanu offices on auction over debts.